I don't often talk about fish art because there simply isn't a lot of it, but the other day I found an artist who deserves recognition. Riusuke Fukahori was a struggling artist who found inspiration in his pet goldfish. These beautiful works resulted from his chubby, golden muses. Beautiful works inspired by beautiful fish. If you look in the background of the video, you can get a quick glimpse of his fish comfortably living in a 50 gallon tank. 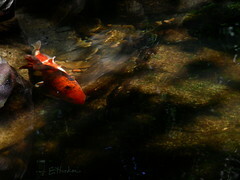 You can find more photos from his ICN gallery expo here: Goldfish Salvation by Riusuke Fukahori at the ICN gallery.